The popular chain has partnered with a sustainable biochemical company to turn used coffee beans into biofuel. offee helps energize millions of Americans each day. In fact, according to the U.K.-based marketing firm Euromonitor, the average American guzzles nearly 90 gallons of coffee each year. But what happens to the coffee grounds after the drink has been consumed? It’s true, some people use the by-product to fertilize their soil (coffee grounds are known to raise the acidity level of soil, which is good for some but not all plants). Many more people simply throw away the ground beans. 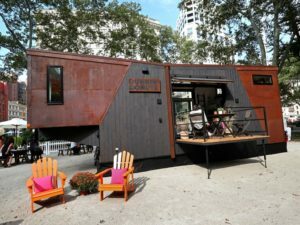 Recently, however, a company has turned to reusing the by-product in the most ingenious of ways: to power roughly 80 percent of the utilities within a tiny home. Dunkin’ Donuts, one of the largest coffee chains in America, has partnered with Blue Marble Biomaterials, a sustainable biochemical company, to create eco-friendly biofuel. The process is one in which the excess oil in the used coffee beans is removed, mixed with an alcohol that turns the product to biodiesel, and then refined into fuel that can be burned to produce energy. According to Blue Marble Biomaterials, every 170 pounds of used coffee grounds yields about one gallon of fuel that can be used in a home. This led Dunkin’ Donuts to showcase its new science experiment. 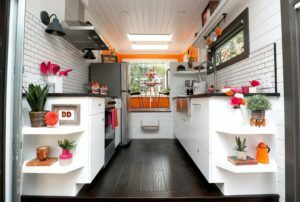 After partnering with New Frontier Tiny Homes (a company that designs and builds tiny homes in the world), the two created Dunkin’ at Home—a custom-built 275-square-foot transportable home. The exterior of the home is made of dark, black-stained cedar wood, to mimic the color and texture of a strong cup of coffee. Inside the home, there is a kitchen, bathroom with a shower, washer and dryer, bedroom, living room, and a small porch. If this is the future of eco-friendly living, then sign me up for an extra-large coffee every morning.